Team NF Member Staci’s dog Madi has been dognapped! But in the alternate reality world of Rising Heroes, poor Madi has been kidnapped by a nefarious shadow organization in retaliation for over 2,500 rebels working together last month to track down and capture a hacker operative with ties to the organization. Alternate reality world? Rising Heroes? Hackers? Madi? Steve, WTF are you babbling about? I’m lost. Okay sorry, let me start back at the beginning. Last month, as I’m sure you heard, Nerd Fitness launched a completely new platform called Rising Heroes, which is our attempt to make ongoing habit-building and self-improvement into a fun, captivating adventure. Thousands of people joined Rising Heroes in early January. They were onboarded and recruited by one of four factions and immediately began working together to track down and capture a hacker by completing real world daily and weekly missions around a variety of self-improvement topics and categories. They solved puzzles, found their wingman for accountability, and decoded intercepted, encrypted messages in their hunt to capture the hacker. They walked over a half million miles combined, while also working on better morning routines, healthy cooking alternatives, social missions and personal development throughout the month. As a member of the broader Nerd Fitness Rebellion, I wanted to give you an update on how this first month went, what we have in store for Month 2, and whether or not Rising Heroes is something that interests you. And I want to leave you with some of the core reasons why it’s working for over 2,500 Rebels and how you can build those benefits into your own system. To start, let me share an image with from the “Michigan Rebel Squad” a self-formed accountability group of a few guys inside of Rising Heroes. I literally burst out laughing when I read it. HAHA, well said Kenny. Well said. That’s fine! If you have a system that’s working for you. Do that! Keep up the progress! But here’s the thing: This is so much freakin’ fun if you let it be! What we’ve seen over the last month is the far majority of 2,500+ Rebels really get into and embrace the adventure, the story, and the daily and weekly missions designed to slowly build better habits and level up their lives. They nerded out, they formed accountability groups, and they used the point system and the deadlines as EXTRA motivation even when they didn’t want to do it… they did it anyway! Stefanie’s comment reminded me of a survey we had sent out late last year where we got over 10,000 responses from nerds around the globe. We asked people whether or not they HAD found sustainable change in the last few years. If they hadn’t yet found the habit-changes they wanted, we asked why. And if they HAD had lasting changes and success we asked them HOW. Most people who have failed to change their lives had cited a lack of motivation, a lack of support, and a lack of time to get things done. URGENCY: We all say we’re going to do something, and then we don’t do it unless we absolutely HAVE to. It’s why we always waited til the last minute to write term papers in high school, why we pay our taxes at 11:59pm on April 15th. When you say you’re going to do something, without a deadline it makes it easy to justify why you can skip it. With a real deadline associated with a goal you’re trying to accomplish, you’re infinitely more likely to do… if there’s accountability associated with the results. SUPPORT: The journey to a healthier life can be a long and lonely one. We often find readers of Nerd Fitness (and members of the team) hide their nerdy pursuits from the world… and once they start the journey to live a healthier life, end up hiding their fitness pursuits from their nerdy friends. We are going to have good days and bad. We are going to have moments when we want to give up. We have things we use to rationalize inaction. Those who succeed have a good group people around them to keep them on target. Always ready to respawn. Knowing how important those three things were to long-term, sustainable success and an upgraded life, we created Rising Heroes. And I’m really proud of what we created. I’m proud because the URGENCY, ACCOUNTABILITY, and SUPPORT are really working for people. 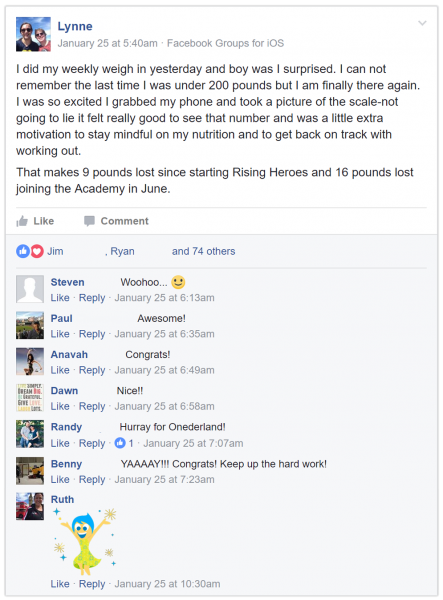 Slowly, but surely people are seeing real results – while having a lot of fun. Note: Rising Heroes cannot guarantee that you will get ENGAGED during an actual real world mission during the adventure. Despite that, we are so excited for Cal and her new fiancee! ? In Rising Heroes, every recruit has to pick a non-fitness specialization that they will devote time and expertise to on an ongoing basis. We’ve had people dust of instruments for the first time in year, enroll in new classes, start back up childhood passions, and picking up new languages and skills. With our new missions setting up Month 2, many Rebels are turning a spotlight on their finances, their mobility, their morning routines, and their daily physical activity. And all this is literally just getting started. Rising Heroes has turned out to be even more than we could’ve imagined. Thanks completely to thousands of Rebels deciding to buy into the process, tracking their success, and truly joining together to take back control of their lives in every sense of the word. Okay, I don’t know if he actual said that, but he might have! Anyways, this has been a truly game changing experience for both the Nerd Fitness team and our core group of early adopters that are sticking with it and starting Month Two right now. As with the first month, we have a small enrollment period where new Rebels can join up and try out Rising Heroes. We shut this off on Thursday of the first week of the new campaigns, so that everyone can move through the rest of the adventure and work together to solve mysteries together at the same time. Rising Heroes is accepting a few new heroes this week until Thursday at midnight EST. As with the launch last month, we offering a full 60 day try-it-out guarantee. Come see if this fun structure and style helps you see real changes like others have. If not, email us – no questions asked – we’ll get you completely refunded. We need help taking on (fictional banking institution) Amego Financial in month two. We aren’t exactly sure how deep this rabbit hole goes, but we are starting RIGHT NOW on the inside with missions to #savemadi and research the reach and influence of this new financial institution. If you are interested in more information, I also recorded a full video walkthrough of inside Rising Heroes using real example from missions and community events from Month One activities. To get a sneak peek inside the platform, click here and scroll down to the read banner “Steve walks you through the inside of Rising Heroes…” Super creative naming, I know. It’s the second video on the page about halfway down. We understand this is an investment and certainly not for everybody, so if this isn’t right for you right now, no worries! We’ll be back to regularly scheduled emails on Thursday. I want you to take out a piece of paper and write out a plan for 2017. What are real ways you can add urgency and deadlines to your habit-based goals in 2017? Can you schedule calendar updates or reminders? Can you create your own missions for yourself? Can you manufacture urgency to help push you? How? How can you add another layer of accountability to your current system? Urgency is a great start, but if you aren’t accountable, you’ll just skip the deadline without any consequence. What parts of your life can you tweak today to have slightly more accountability for the deadlines and urgency you’ve brainstormed above? Lastly, where are you going to go for support? This can overlap with accountability sometimes, but needs to be more well rounded. What will you use to educate yourself? Who will you talk to in moments of weakness? Who will you celebrate with when you hit a streak? There are hundreds of free resources (including most of Nerd Fitness) for you to explore. And it is possible to find and set this up for yourself. How will you do it? Whether or not you want to try Rising Heroes, I want you to be intentional TODAY about how you will build these three key factors into your own life in 2017. February can be a tough month for our 2017 goals and ambitions. A lot of people fall off the wagon, but around here we #respawn quickly and get back into the fray. Let’s keep up the early momentum of January in whatever way works best for you. New YouTube video coming on Thursday around why motivation fails us (and what to use instead), stay tuned! As you can tell, I’m really proud of this mysterious, goofy, action-oriented adventure we call Rising Heroes. And I appreciate you taking the time to read my giddy Rising Heroes update. If you want to join us, 2,500+ Rebels and I are waiting for you on the inside. Once you get recruited into your faction, you can start marking off time-sensitive missions immediately. We need all the help we can get, Month Two is going to be crazy. You have until Thursday at midnight EST to click here and join Rising Heroes for our new February campaign.